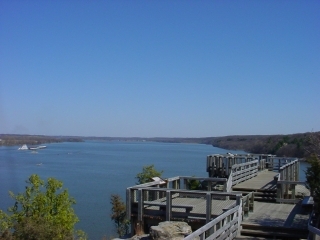 The Starved Rock Park has 13 miles of hiking trail and a lot of wooden fenced in platforms to overlook the canyons in the park. One of the larger rock formations, Eagle Cliff, offers a great view on the majestic Illinois River that forms the northern border of the park. On a clear day, this is a superb location to see the Bald Eagles that nest in the park and hunt for fish in the Illinois River.